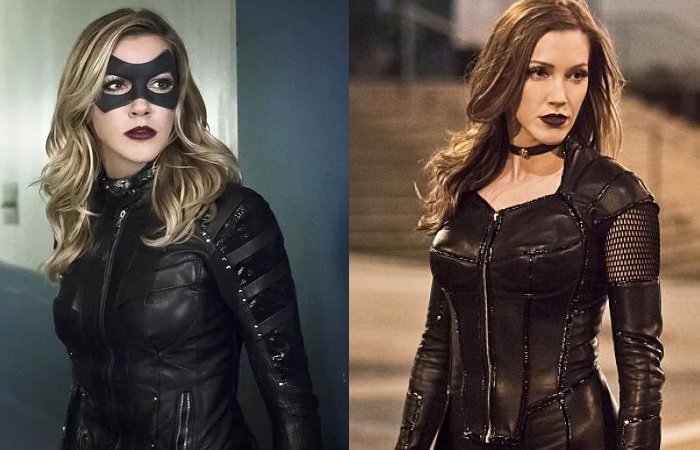 Laurel’s Black Canary was killed in Season 4 by Damien Darhk, and both Oliver and the show itself spent much of the past season mourning her loss. During the “Invasion!” crossover event, we also saw something of a Matrix-esque homage to the character in Arrow’s 100th episode in which the Dominators create a dream world where Laurel and Oliver are about to be married, among many other changes. The mid season finale then featured a lot of traumatic moments breaking apart the team, including the imprisonment of John Diggle, prominently featured in both versions of the promo. We previously theorized how Laurel’s appearance could be possible in the Arrowverse, but this new promo seems to quickly reveal that it’s some sort of alternate universe Laurel who still has her Canary Cry, this time perhaps without the use of a collar or necklace. Is this an Earth-3 meta version of Laurel perhaps? You might remember that an Earth-2 version of Laurel made an appearance as a lieutenant in Zoom’s meta-human army towards the end of The Flash Season 2. That version called herself Black Siren and had a Canary Cry-styled scream that could rip through entire buildings. The following new promo seems to imply that we’re dealing with an alternate universe Laurel with less than friendly intentions, a doppelgänger that might be one in the same as Zoom’s henchwoman. Last we heard, Black Siren was left imprisoned in the pipeline by Team Flash at STAR Labs following the Season 2 fiasco. What if Flashpoint had something to do with Earth-2 Laurel getting loose and teaming up with Prometheus? If this is indeed Earth-2 Laurel, then she’s clearly trapped in Earth-1 with no way to get home, which might explain why she would try to impersonate her doppelgänger. What’ll really be interesting is if she’s just doing it for kicks or if she’s working with Prometheus and/or has her own hidden agenda. When Arrow comes back on January 25, expect for Team Arrow to be shocked and shockwaved when this Laurel unleashes her shout voice on them.